It's time again to check in with the celebrities and the stylists of Hollywood, to see what glittering jewels the stars borrowed to wear for this year's Emmy Awards! Here's a selection of some of my favorite pieces that walked the red carpet on Monday night. As has been the case for several years now, statement earrings were the major spotlight jewels at this year's ceremony. Rachel Brosnahan, who took home the award for Outstanding Lead Actress in a Comedy Series for her work on The Marvelous Mrs. Maisel, wore earrings from Tiffany's Paper Flowers collection. Fresh Off the Boat (and Crazy Rich Asians!) star Constance Wu chose classic diamonds from Harry Winston to present an award. Westworld actress Thandie Newton, who took home the award for Outstanding Supporting Actress in a Drama Series, also wore diamond earrings by Harry Winston. 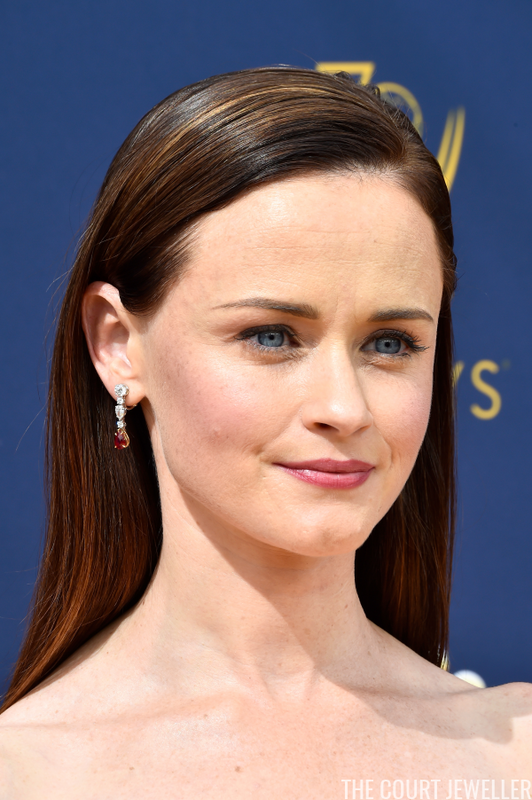 Harry Winston loaned a pair of diamond line earrings with pear-shaped ruby drops to Alexis Bledel, who was nominated for Outstanding Supporting Actress in a Drama Series for her work on The Handmaid's Tale. Rubies and diamonds were also the gem of choice for Sandra Oh, who was nominated for Outstanding Lead Actress in a Drama Series for her role in Killing Eve. 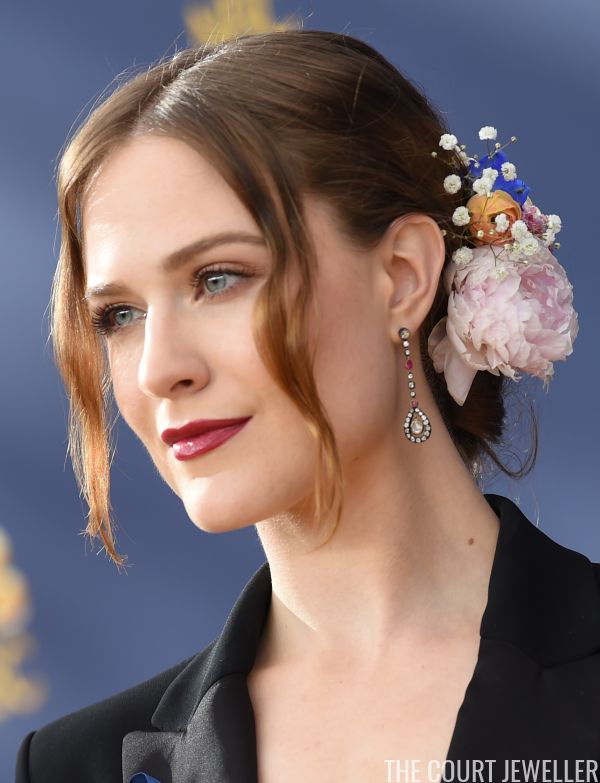 Evan Rachel Wood, who was nominated for Oustanding Lead Actress in a Drama Series for her work on Westworld, joined in the ruby trend with a pair of nineteenth-century diamond and ruby pendant earrings from Fred Leighton. 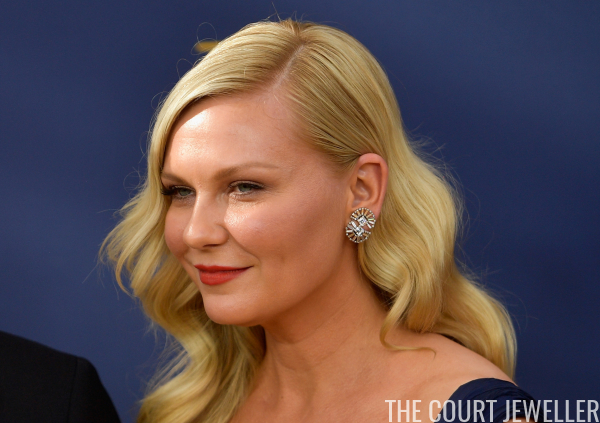 Fred Leighton also loaned this fantastic pair of Suzanne Belperron diamond double fan earrings to Kirsten Dunst, who accompanied her fiance, Jesse Plemons; he was nominated for Outstanding Lead Actor in a Limited Series or Movie for his role in Black Mirror. 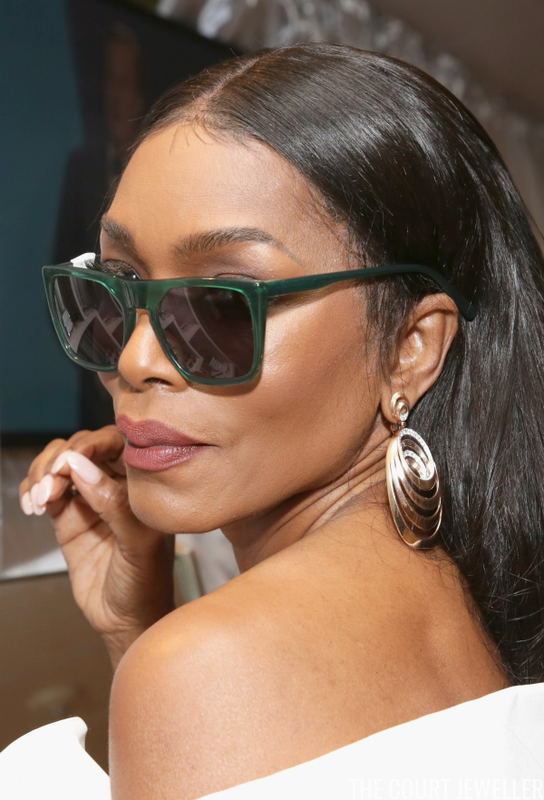 Presenter Angela Bassett gleamed backstage in diamond and gold earrings from Gismondi. Actress and model Poppy Delevingne sparkled in an astonishing pair of diamond and citrine earrings by Amwaj. 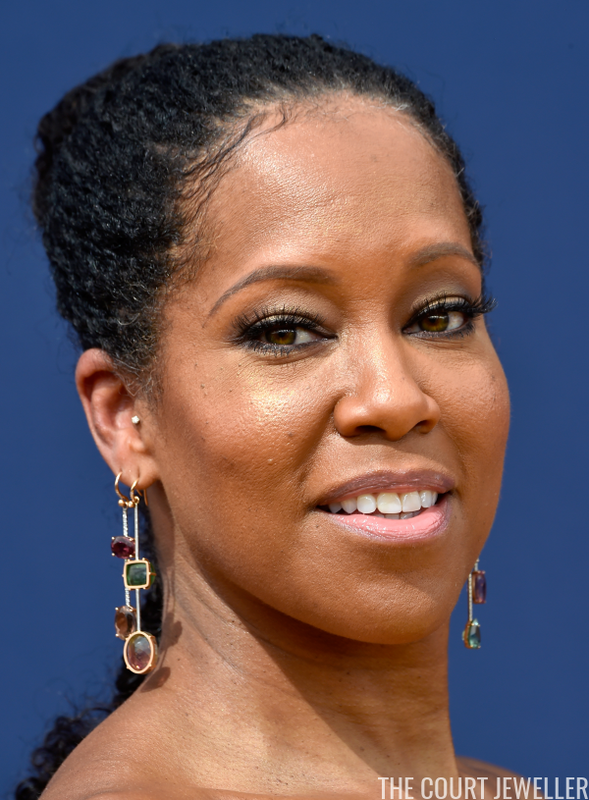 Regina King, who won the award for Outstanding Lead Actress in a Limited Series or Movie for her role in Seven Seconds, dazzled in colorful gem-set earrings from Irene Neuwirth. Irene Neuwirth also loaned a bright pair of earrings to Connie Britton, who presented an award during the ceremony. Shades of green were all over this year's red carpet jewelry. Allison Janney, nominated for Outstanding Lead Actress in a Comedy Series for her role on Mom, wore earrings by Jared Lehr. 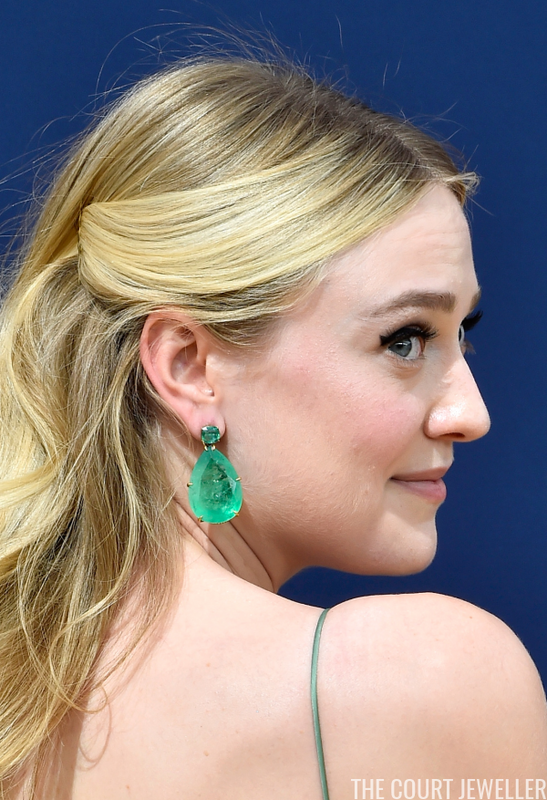 And actress Dakota Fanning was stunning in Colombian emerald earrings borrowed from Lorraine Schwartz. Also wearing Lorraine Schwartz: Heidi Klum, who wore astonishing jewels set with white and pink diamonds. The Assassination of Gianni Versace actress Penelope Cruz, who was nominated for Outstanding Supporting Actress in a Limited Series or Movie, also wore a classic necklace and earrings; these are from her own collection with Atelier Swarovski. Two of our favorites from The Crown sparkled in major gems for the evening. 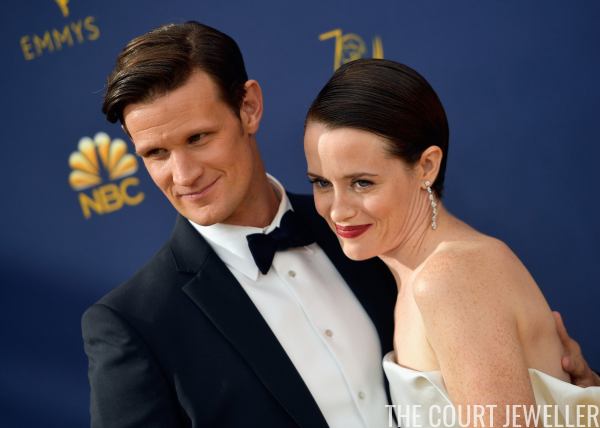 Outstanding Lead Actress in a Drama Series winner Claire Foy wore pendant earrings (see the top image of this post) and a diamond ring from Kwiat Diamonds. ...and more stunning gems on her wrist. But I think my highlight of the evening was perhaps this Anabela Chan amethyst ring, worn by actress Chrissy Metz. Look at that luscious violet stone!